Is Du30's Hint to Resign an Indication of Bongbong Marcos' Recount Win in Camarines Sur? Is Du30’s Hint to Resign an Indication of Bongbong Marcos’ Recount Win in Camarines Sur? Bongbong Marcos said that if he gets half of the 600,000 undervotes of Camarines Sur, no further recount is needed. This is likely because most if not all VP candidates during the election 2016 are from Bicol. Former Senator Gringo Honasan, Senators, Allan Peter Cayetano, Antonio Trillanes IV and Chiz Escudero are also from Bicol like VP Leni Robredo. Coincidentally, President Rodrigo Du30 hints of resigning that is now trending via social media. Marcos needs only 263,473 votes to be the rightful Vice President. Besides, it is unlogical that most votes just went to Robredo. 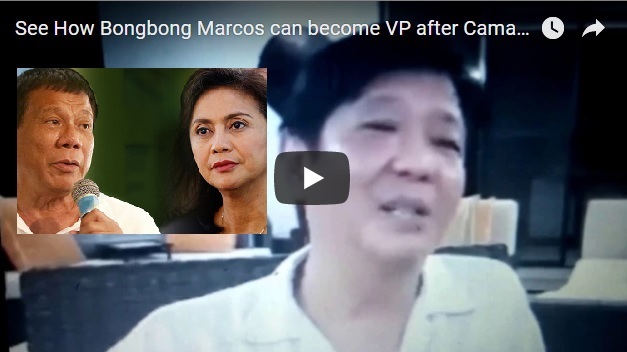 [VIDEO]: Bongbong Marcos said that the anomalies found in the digital copies can easily surpass the discrepancy in Robredo’s VP win. Bongbong Marcos signs a JOINT MANIFESTATION to withdraw all and any pending motions relative to his election protest. Marcos’ spokesperson, Atty. Vic Rodriguez said that Robredo has no intention of withdrawing her pending motions because she did not sign the JOINT MOTION that her lawyer presented to the media. Rodriguez pointed out that in his JOINT MOTION only the name of Robredo’s counsel, Atty. Romulo Macalintal, appeared on the document. According to Rodriguez, the absence of Robredo’s signature puts into question her sincerity to hasten the pace of the electoral process. It likewise casts doubt on the authority of Macalintal who signed the motion. Robredo could later on even disown the motion because it was made without her conformity. “Without Mrs. Robredo’s signature, the motion is a mere scrap of paper and maybe later disowned by her as having been signed without her authority. Looks like she wants to deceive the people again,” Rodriguez said. Rodriguez questions the JOINT MOTION prepared by Macalintal saying the same only covered pending motions and not future motions that may delay the proceedings. He said Marcos’ JOINT MANIFESTATION was more sincere because it covered both present and future motions in the election proceedings. Macalintal then signed the joint motion with a prayer asking the tribunal to “withdraw any and all pending motion which may delay the recount proceeding.” Macalintal plays the PET again and said that ballot recount is set to start on March 19. President Du30’s speech wherein he said that he might not finish his 6-year term because he has lots of enemies, stirs social media users. Both anti and pro Du30 supporters are reacting. The President is well-known for his squeaky move. He stunned everyone with the late President Ferdinand E. Marcos’ burial at the Heroes’ Cemetery. It is not impossible that one day, Filipinos wake up the next day only to find out that Bongbong Marcos is already the new President. It’s a shame that NO ONE really TRUST ROBREDO.